Sorry, this event is now cancelled, due to the weather conditions. All are welcome to join St Mary’s Comberton on Friday 2nd March at 7.30pm for a special service with an environmental theme. 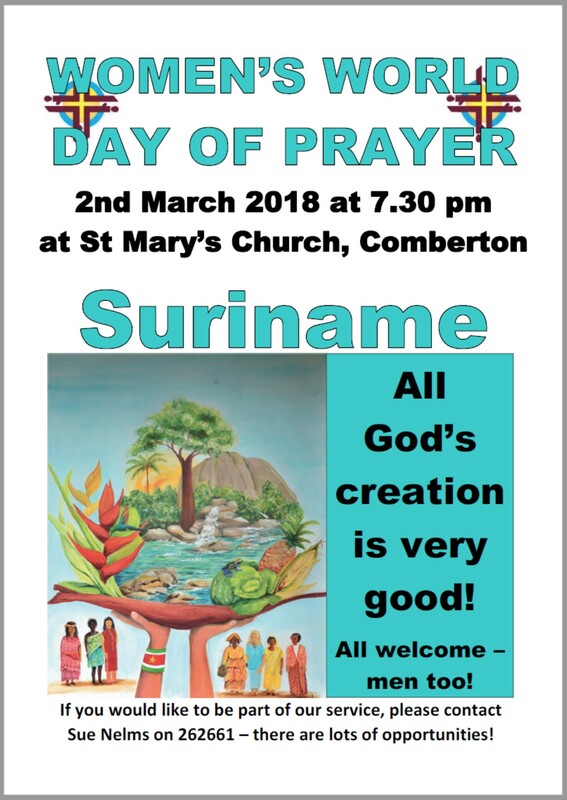 This year’s service to mark the World Day of Prayer (formerly Women’s World Day of Prayer) has been put together by a team from Suriname and is called ‘All God’s Creation is Very Good!’. The theme is caring for our environment and there will be much to challenge us and our way of life. There are plenty of opportunities to be involved, so if you would like to take part, please talk to Sue Nelms on 01223 262661.